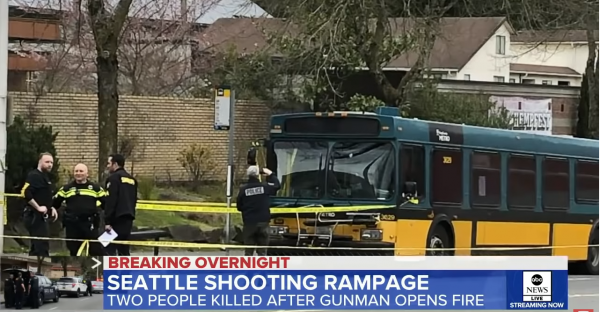 Following a chaotic carjacking last week in which one person was fatally shot and another died in a head-on crash with the fleeing suspect, Seattle anti-gunners including Mayor Jenny Durkan are overlooking the traffic fatality and focusing on gun control. Not a word there about how the suspect, identified as Tad Michael Norman, crashed head-on into a car driven by a 70-year-old man who died as a result of his injuries in that collision. Not a peep about the second fatality being a traffic death. The impression from this is that both people died from bullet wounds. But the Alliance had company, ABC’s Good Morning America also headlined essentially the same message (see screen snip, above). And instead of blaming the alleged perpetrator, it appears to be the gun’s fault. Does purchasing cough medicine require a federal background check? Since when does it require filling out a federal form that is retained by the pharmacy for 20 years? There are published reports that the suspects suffered some sort of alcohol-induced blackout. But there was really nothing from Durkan or the gun control lobbying group about driving under the influence. The suspect reportedly used to work as a contractor at Microsoft, but is currently unemployed. He is reportedly married. He did not have any sort of criminal record before last week’s deadly incident. Now he stands charged with two counts of first-degree murder and three counts of attempted first-degree murder. The family has suggested remembrances to the Alliance. There was another irony last week. Two days after the Seattle incident, a federal judge in California struck down that state’s ban on so-called “high capacity magazines,” an issue supported by anti-gun groups for many years. U.S. District Judge Roger Benitez declared the state’s prohibition was unconstitutional. The state will undoubtedly appeal to the Ninth Circuit Court of Appeals in San Francisco, and from there, if the case is further appealed, it would go to the U.S. Supreme Court, which has been reluctant in recent years to take on another Second Amendment case. But the face of the high court has changed, with a more conservative and “originalist” attitude. It has already accepted one gun rights case out of New York, and there are at least two others that have been submitted for review, including one involving the Bellevue-based Citizens Committee for the Right to Keep and Bear Arms. Gun prohibitionists do not like the Benitez ruling one bit. It’s an interesting 86-page report that may be read here. Previous articleDid Anti-Semitic Dem Rep. Ilhan Omar Illegally Use Campaign Funds for a Divorce, International Travel?